So I went to my favorite pizza shop today and noticed that 3 large slices cost more than a small pizza. I wondered how much more profitable those slices were... it took me a while, but I finally have the answer. Hungry but watching your wallet? 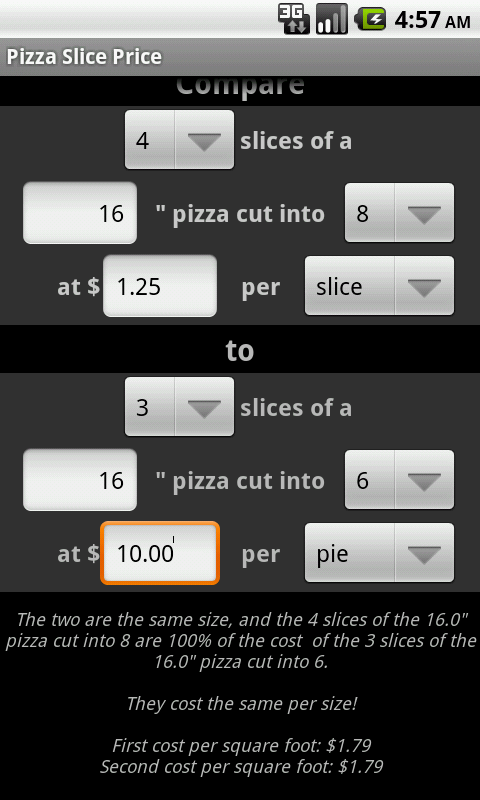 Pizza Slice Price lets you compare sizes and prices of slices and whole pies. Whether you're in the mood for a couple slices from a neighborhood restaurant, a 16" from a large chain, or a favorite homemade recipe, as long as it's round, you can calculate it!